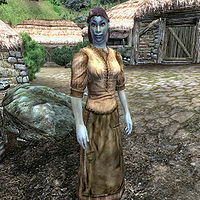 Malyani Dalvilu is a Dunmer farmer residing in Bleaker's Way, a small village in the Great Forest. Like the other members of the Dalvilu clan, Malyani lives in harmonic co-existence with her next-door neighbors, the Ulfgars, and takes it easy in life. She sleeps in her house every night between midnight and 6am and always starts the day with a two-hour breakfast. After a bit of wandering, and only if you have reached stage 30 of the related quest, she leaves the house at 10am for a meeting with clan leader Nivan Dalvilu in the center of town. She returns home at noon and spends four hours there, before leaving for the popular Bleaker's Way Goodwill Inn at 4pm. After two hours of socializing she goes back home at 6pm and spends all evening inside until her bedtime at midnight. The exception to this routine occurs during the last stages of the Mephala quest, when she learns that the Ulfgars are responsible for the death of her beloved Nivan. She will then draw her iron dagger and proceed to attack every living member of the Ulfgar clan. If she survives, she will return to her regular peaceful existence but will cancel her 10am meeting with Nivan, for obvious reasons. She wears a set of typical lower-class attire, a coarse linen shirt with matching linens and shoes. She carries her dagger, her house key and a small amount of gold. This page was last modified on 6 February 2019, at 16:42.